Top 10 Best Things to do in Kathmandu - The places should not be missed. When you think of Nepal, I bet Mountains are the first thing that crosses your mind. At least it does in mine! Home to eight of the 14th tallest mountains in the world – including Mount Everest, the tallest one – Nepal is famous for its Himalayan beauty. This makes Nepal one of the most distinct hiking and trekking destinations in the planet. Not just mountains, Nepal is known for having the most diverse topography from all the way down the Terai plains and everything in between! Tallest Mountains, Deepest Valleys, Breathtaking Himalayan Lakes, and Gorgeous Landscapes . . . But what about Kathmandu? Kathmandu – the capital of Nepal will be your first stop in Nepal. Most say that there isn’t much to do in the city but I beg to differ, I believe Kathmandu has more to offer than what meets the eye. Kathmandu is a burst of culture, colour, heritage, spirituality, ethnicity, and passion. From shopping, pubs and partying, to temples, stupas and UNESCO World Heritage sites, this list has it all! 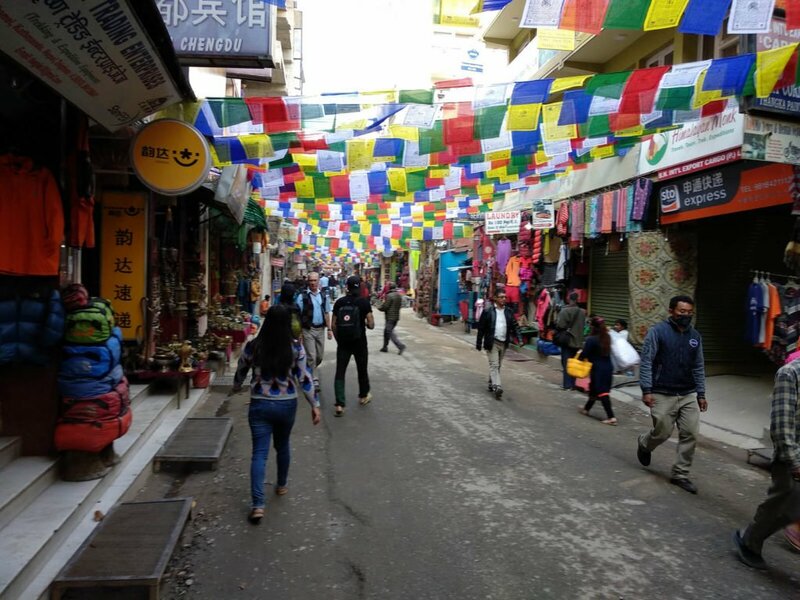 Located in the heart of Kathmandu, Thamel will definitely warm your heart. It has been a distinct tourist district and one of the largest commercial neighborhoods in the city. It is the centre of the tourist industry and has been the hottest spot for tourism in the Kathmandu Valley. Thamel can get crowded, especially during the peak seasons but with rows of Tibetan prayer flags and cycle rickshaws, Thamel will still give you Kathmandu in its truest form. However, a recent law has prohibited vehicles inside Thamel which has only made it better! Thamel is renowned for its night-life and restaurants that serve traditional and continental cuisine. With hundreds of bars that open till midnight and a couple of clubs that are lit till 4 am, Thamel takes on a whole different vibe. Lights and the sound of live music drifts from its bars. Constructed as early as the 3rd century, the Kathmandu Valley hosts three UNESCO recognized World Heritage Sites – the Kathmandu, the Patan, and the Bhaktapur Durbar Squares. 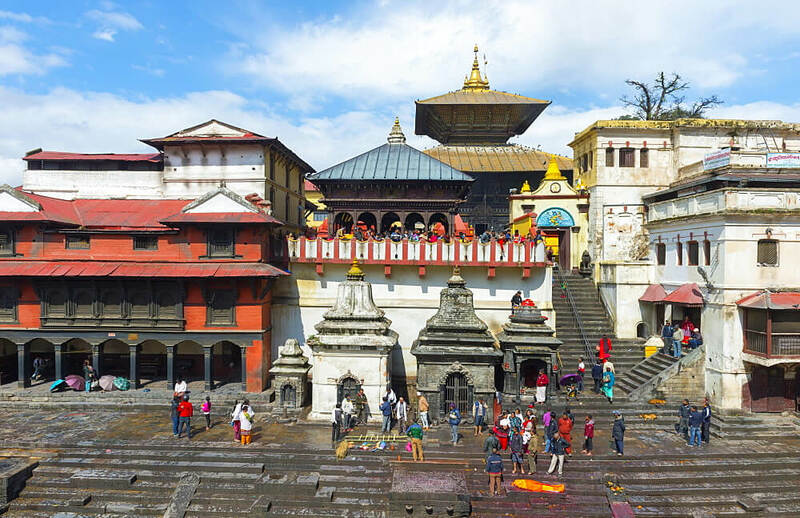 Kathmandu’s ancient old city is set around the Kathmandu Durbar Square at Basantapur, south of Thamel, where the royal family lived until the 19th century. It is one of the more prominent Durbar Squares out of the three. The palace is decorated with elaborately-carved wooden windows and panels and houses the King Tribhuwan Memorial Museum and the Mahendra Museum. These Durbar Squares are excellent examples of the ancient traditional Nepali architecture in its purest form. 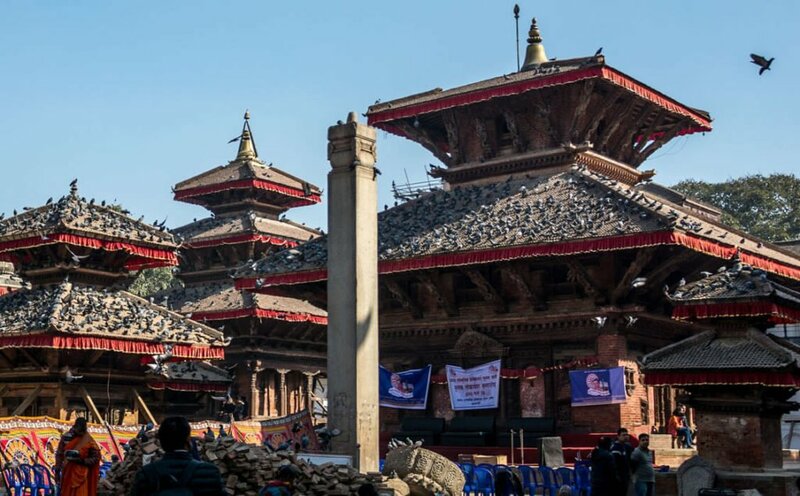 Sadly, a huge earthquake destroyed most of the southern section of these heritage sites and badly damaged other buildings, including the palace, in the 2015 Nepal Earthquake. Poor maintenance, ongoing restoration works, and the high price of tickets have discouraged many tourists from visiting the Durbar Squares. The Pashupatinath Temple is Nepal’s most sacred Hindu temple that is situated on the banks of the Bagmati River. Built for the national deity Lord Pashupatinath, the Pashupatinath temple holds a shrine for many other Hindu gods. Pashupatinath is an incarnation of the Hindu god Shiva as “lord of the animals”. In Nepal, he is unofficially regarded as a national deity and draws millions of devotees from the Indian subcontinent along with a motley collection of naked painted sadhus (Hindu ascetics) on his birthday- The Maha Shivaratri. The Swayambhunath Temple is perhaps the most famous Buddhist temple in Nepal. It is an ancient religious stupa that sits atop a hill to the west of Kathmandu city. It was founded at the beginning of the 5th century and is the oldest of its kind in Nepal. Swayambhunath occupies a central position, it is probably the most sacred among Buddhist pilgrimage sites. For Tibetans and followers of Tibetan Buddhism, it is second only to the Boudhanath Stupa; both listed under UNESCO World Heritage Sites earlier. One of the most distinctive features of the Swayambhunath Temple are the monkeys. You’ll meet hundreds of them that live on, and roam around, the temple premises. The monkeys are considered holy, although it’s a strange myth as to why – it is believed they were created from the head lice of Buddhist deity Manjushri, who was raised there. The Hanuman Dhoka Palace gets its name from Hanuman (the monkey God), an ardent devotee of Lord Rama. ‘Dhoka’ translates to Door/Gate in Nepali and the Hanuman Dhoka has a large standing statue of Hanuman, the Hindu deity. Dated to 1672, Hanuman Dhoka is the entry gate to the palace, where a standing statue of Hanuman guards the palace. Spread over 5 acres, it is a complex of structures with the Royal Palace of the Malla kings and also of the Shah dynasty in the Durbar Square of central Kathmandu. 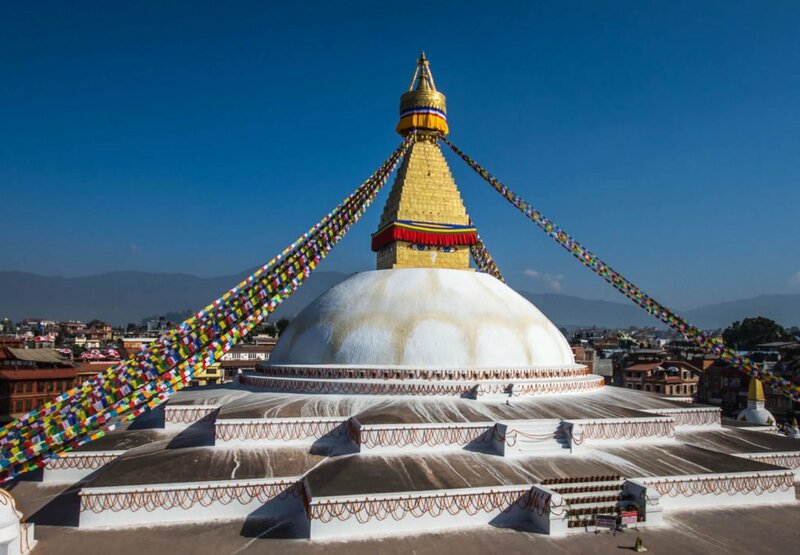 Located on the northeast outskirts of Kathmandu, Boudhanath Stupa is one of the largest spherical stupas in the world. If you are visiting the Pashupatinath Temple, Boudha is only a 20-minute walk away. It’s an important centre of Tibetan Buddhism and culture and was also recognized as one of the UNESCO World Heritage Sites. With hundreds of cafes, restaurants, shops and hotels around, Boudha is one of the most popular tourist sites in Kathmandu. The Tibetan Buddhists come out to circumambulate the stupa when the sun sets, accompanied by the gentle chanting of the mantra Om Mani Padme Hum as they spin the prayer wheels. Don’t miss out on the traditional Tibetan dish – Laphing while you are there. And if you have the time be sure to visit some of the many gompas (monasteries) around Boudhanath. Durbar Marg or King’s Way is a posh street that runs straight from the Narayanhiti Palace Museum; now a museum but formerly the palace of the last monarch of Nepal. Durbar Marg is more of a modern street with the fanciest restaurants, international clothing and footwear brands, 5-star hotels, pricey boutiques and commercial centres. From banks, offices, art galleries and decor to restaurants, bars and clubs; you can find the best of them at Durbar Marg. It is a great place to shop if you are looking for original international brands. However, there isn’t much difference in the price from where other countries (in fact they can even be a bit more expensive since they’re all imported from India and China). Freak Street is a small street at the south of the Kathmandu Durbar Square in Basantapur. Currently known as the Old freak Street or the Jhochhen Tole, this ancient street was named so because of the hippie trail in the 1960s and 70s. Freak Street became popular when cannabis was legal in Nepal. Hippies from all over the world travelled to Freak Street for legal cannabis that was sold in government licensed shops. Today, Freek Street is still heavily influenced by the hippie culture but has had a shift to more conventional businesses of trekking and tourism. However, it is a hub for culture, art and architecture, and unique lifestyle and great tattoo places. Built by King Mahendra n 1963, the Narayanhiti Place or Durbar served as the residence for the Royal Family of Nepal for generations. The palace complex is located towards the east of the Kaiser Mahal next to Thamel. Located in the capital city of Kathmandu, the palace was the centre of state occasions and royal hospitality. 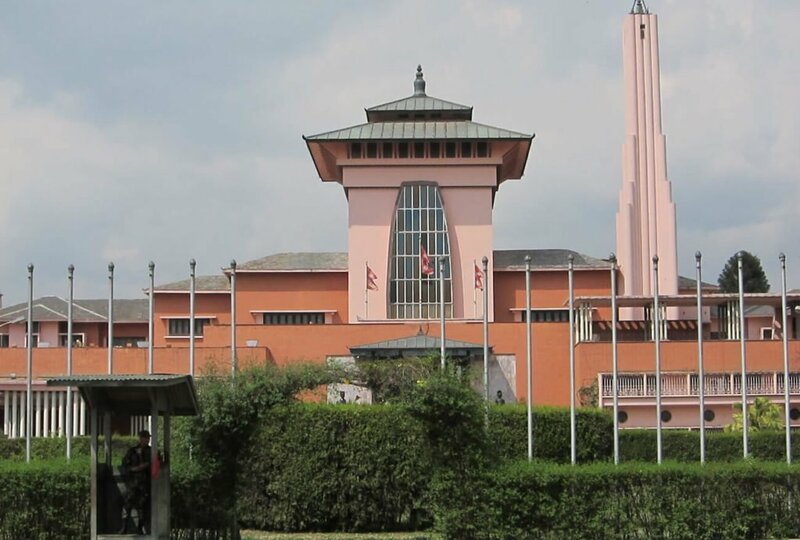 It was the residence and principal workplace of the last reigning monarch of the Kingdom of Nepal – King Gyanendra Bir Bikram Shah Dev before the monarchy was abolished on 28 May 2008. Now a Museum with absolute public access, the Narayanhiti Palace Museum is incorporated in an impressive and vast array of courtyards, gardens and buildings. 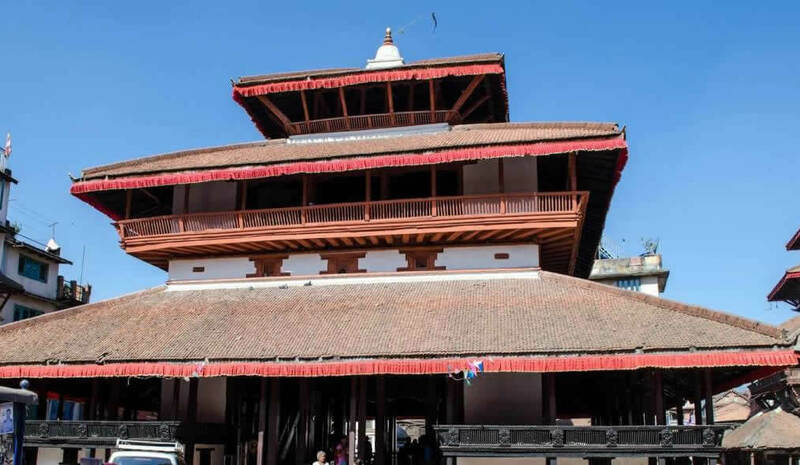 Literally translating to Wood-Covered Shelter (Kastha: wood, mandap: pavilion), Kasthamandap was a three-storied public shelter that included a shrine consecrated to Gorakhnath situated at Maru, in Kathmandu. The building is a preserved relic from Nepal’s ancient history and is a testament to its centuries-old architectural style. The newly discovered objects after the of the 2015 earthquake have suggested that the Kasthamandap may have been built in the 7th century. This makes the Kasthamandap temple one of the oldest and most striking buildings in the country. Legend has it that the temple was built without using a single nail or a rivet and from the timber of a single Sal tree! Kathmandu has everything for everyone so the next time you’re thinking of visiting Nepal and you are worried about the time you have to spend in the city, don’t worry about what you could do here. These are probably the best things you could do in Kathmandu. From quite museums to exciting nightlife, there is so much you can do here in Kathmandu!